Support your body like never before with the latest in scientific advancements and new, clinically studied probiotic strains. Forever Active Pro-B™ works primarily in the intestines where it assists with the process of food digestion, helping to release nutrients for absorption and contributes positively to normal human growth and development by helping to maintain a balanced and healthy immune and digestive system. Forever Active Pro-B™ includes FloraActive—a range of beneficial probiotic strains from Copenhagen University Hospital, a leader in the gastroenterology field. 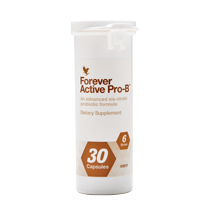 With a proprietary blend of 6 different strains, Forever Active Pro-B™ provides 8 billion CFU per dose. This formula also includes a prebiotic fiber to sustain the probiotics during storage, transport and delivery to the gut. Prebiotics provide the ideal environment for the probiotic to function and thrive. As probiotics themselves are quite fragile, Forever Active Pro-B™ uses an exclusive, cryo protection technology that protects the probiotics during manufacture and throughout shelf-life. The strains in Forever Active Pro-B™ have been selected and engineered to have high resistance to stomach acid and bile salts allowing them to reach the intestine. Clinical studies have shown these strains have a greater ability to colonize and proliferate and survive the passage of the GI Tract. But, that's not all. Forever Active Pro-B™ is a vegetarian capsule packaged in a unique vial that uses Activ Vial Technology™. This new packaging includes an engineered desiccant sleeve built into the bottle to control moisture absorption and protect the probiotics throughout their shelf-life. Try Forever Active Pro-B™ in tandem with our patented aloe vera, which acts as a prebiotic. Whether your goal is to promote a healthy digestive system or enhance nutrient absorption and immune function, add Forever Active Pro-B™ to your daily supplement program.